What a whirlwind of a week. I haven’t had much time on here and with my last post well over a week ago, I have some serious catching up to do. I haven’t had extra time to make the finer things, like planned desserts, but this grilled ratatouille was superb with grilled steak. 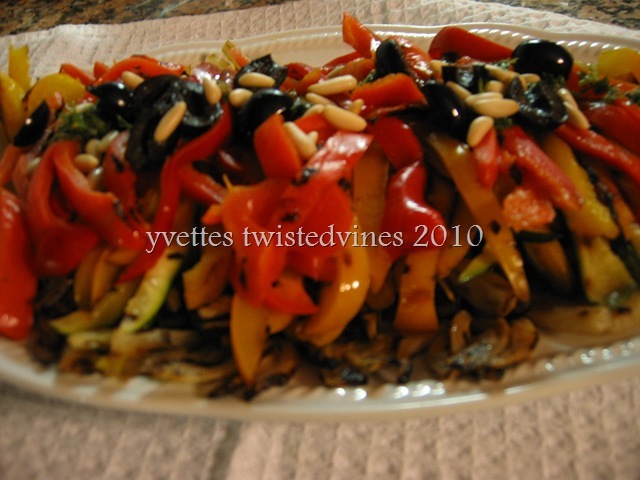 Fennel,zucchini,red and yellow peppers,and eggplant make up this delicious combination. 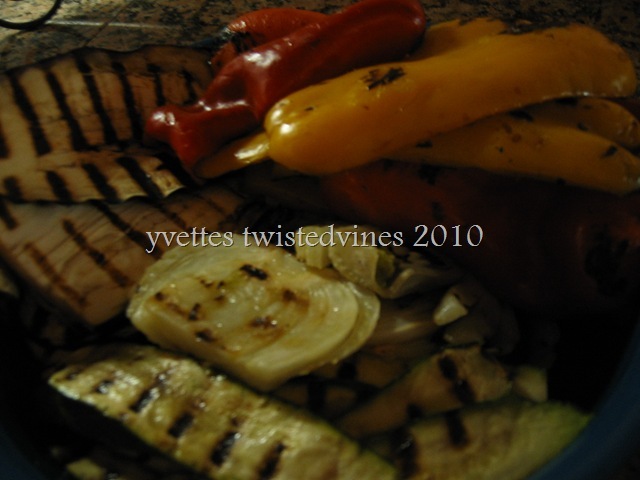 Cut vegetables into large pieces and place on grill. 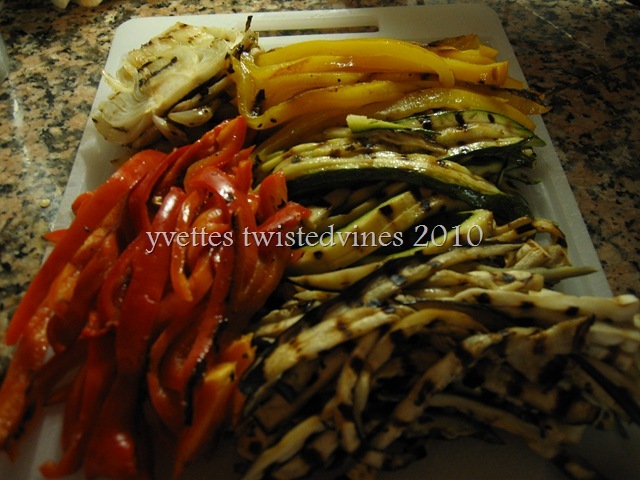 Arrange in orderly fashion, first the fennel then zucchini and eggplant and finally the colourful red and yellow peppers. Finely chop the anchovies and capers and place in mixing jar. 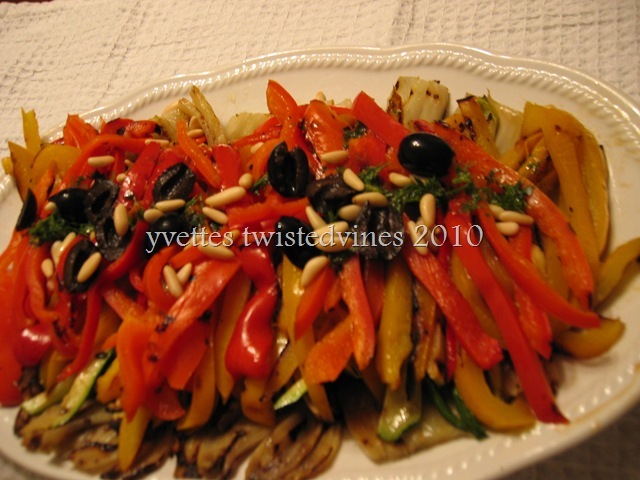 Add balsamic vinegar,olive oil, zest and lemon juice,black pepper and mix well.Pour over grilled vegetables with a sprinkling of black olives and pine nuts. Serve warm of cold as you like. Nice and easy entertaining, great to the eye and the taste buds. Try it for your next warm Summer evening grill. Whatcha Makin’ Wednesdays at Scrapaddict4sure. Looks absolute divine Yvette. Definitely one to try. Heavenly! I am far from a vegetarian but Cindy is absolutely right, this is a meal on its own! This looks good. I would love it if you stop by my blog and linked up this recipe . What beautiful ratatouille! It looks mouthwatering!! So lovely!! I’m definitely trying this!! 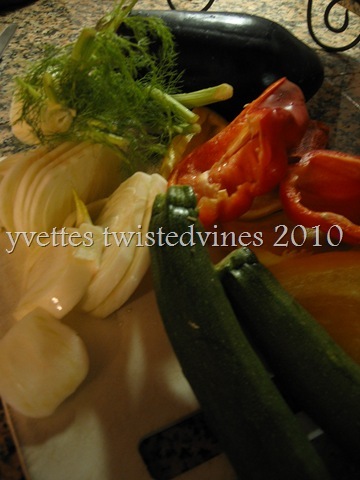 Yvette, what a lovely alternative to the normally soup stew we make! Thank you for the inspiration! Love the grill marks, I’ll bet it tastes delicious! I still haven’t tried fennel! Thanks! This looks yummy, especially the recipe for your dressing. Thanks for sharing…I’m looking forward to trying this one out!